Dogs may now go onto restaurant patios in New York. That is because a new state law is letting restaurants to open outdoor dining areas to them. The measure was signed into law by Democratic Governor Andrew Cuomo. Other states have similar laws. Those states include California and Florida. Maryland also has a similar law. Dog lovers and many restaurant owners in New York support the idea. They note that pooches must be leashed. Restaurants can choose to keep them out of outdoor eating areas. Health officials voiced their worries. But Cuomo said the law's "firm health and sanitary guidelines" have the right balance. "This action will give restaurants an additional option to boost revenue by appealing to this new audience of dog-owning New Yorkers. And their four-legged friends," Cuomo said. Dog owners are very happy. "I think this speaks volumes to where we are as a society. Most people with dogs view them as members of the family," said Kim Wolf. Kim is a New York City dog owner. Kim works for an organization that helps people in poor neighborhoods care for their animals. Michael O'Neal is a restaurant owner. He hopes the law will settle any doubt about bringing dogs to his restaurant. It is called the Boat Basin Cafe. The cafe is in Manhattan's Riverside Park. Dog owners often stroll through. Sometimes they stop in with their pets. 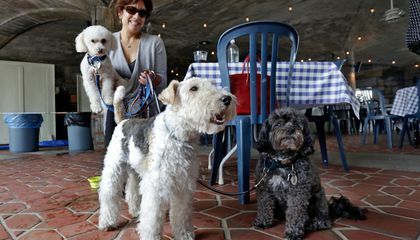 "In a park or in a sidewalk cafe, people should be allowed to have their dogs," O'Neal said Tuesday. The state Association of County Health Officials opposed the law this spring. They said they were "deeply concerned." They were worried about biting and cleanliness. They were also worried about bringing "additional public health risks into food service establishments where none need exist." But the association's members will follow the law. That is according to Executive Director Linda Wagner. Evelien Kong is a Manhattan dog owner. She is excited about doggie dining. But she understands those who are not. "Maybe there is a happy medium." Kong said. They could have dog-friendly and dog-free sections of restaurant patios. "There has to be a healthy, mutual respect for both sides." The bill's sponsor is Assemblywoman Linda Rosenthal. She is a democrat from Manhattan. She said "99.9 percent" of people she has talked to support the law. "Once in a while you hear, 'I am never going to go to restaurants that allow dogs,'" she said. "That is the beauty of the bill. The restaurant owner gets to choose." A law meant to help New York's cats did not do so well. Cuomo vetoed a proposal to fund groups that trap and neuter feral cats. Then the groups release the cats back into the wild. In the veto, he noted that releasing wild cats is technically illegal. He also noted that feral felines threaten local wildlife such as birds. A recent Siena College poll shows dog owners may have more political pull anyway. The survey found that 57 percent of New Yorkers consider themselves "dog people." Seventeen percent call themselves "cat people." Overall, 30 percent said they have a dog. Twenty percent live with a cat. Nearly 10 percent own at least one of each. Cuomo has neither. His girlfriend is chef Sandra Lee. She has two cockatoos. How does this new law help restaurants? I think it helps them because some people might not wont to leave there dog alone so the might not go to the restaurants. But if they can take there dog they wont think about it. They will go it and eat. I think that more restaurants going to have more money cause the people, that like to go out to eat that they might set up a price for to eat outside like $15.00 an plus the food so at least $21.00. The restaurants will get more money and business. Restaurants lose money because some pet owners want to take their pets inside. I think this is a good law because it will benefit both restaurant owners and pet owners. I think that it is a good idea to allow dogs to eat with their owners at restaurants. The first reason I say this is what if the owners are riding around with their dog in the car and get hungry. I would say that it would just be messed up if the owner just leaves the dog in the can and goes to eat. Another reason that I say this is because I am a dog owner. Dogs dont need to going somewhere with their owners to get food because their hair might get in their food.if dogs hair get in your food they might can get sick from it or have a hair cloth somewhere in your body and the doctor might cant get it out.